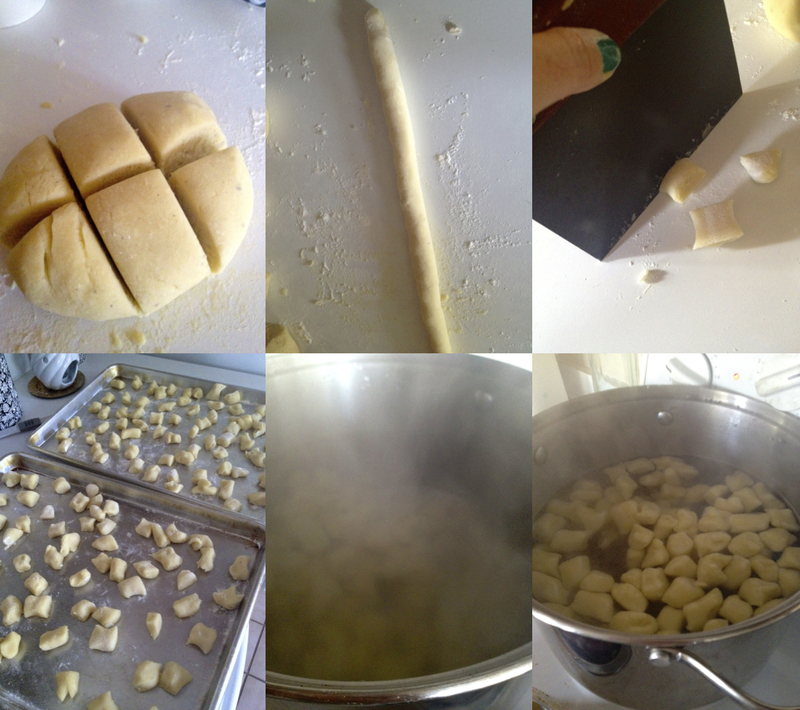 I absolutely love gnocchi but I never thought I could make it myself. My husband and I have mastered making fresh pasta for raviolis and fettucini but I thought this would be much more complicated. If the gnocchi dough is overworked it can be really chewy and tough which makes for a very unappetizing combination. When cooked correctly, gnocchi is best described as “little pillows of pasta”… they’re light and soft and can be prepared so many different ways making it not only delicious but versatile. In this post I’ll give you the recipe and the step-by-step photos for a potato based gnocchi and then later in the week I’ll give you another recipe that’s my favorite way to prepare it! Start off by filling a large pot that’s fit with a steamer basket (we use this one) with about 3″ of water and bring to a boil. Meanwhile, peel and cut into 1″ pieces 1 1/2 lbs russet potatoes. Once the water has come to a boil, add the potatoes to the steamer basket, cover and steam for 15 minutes. 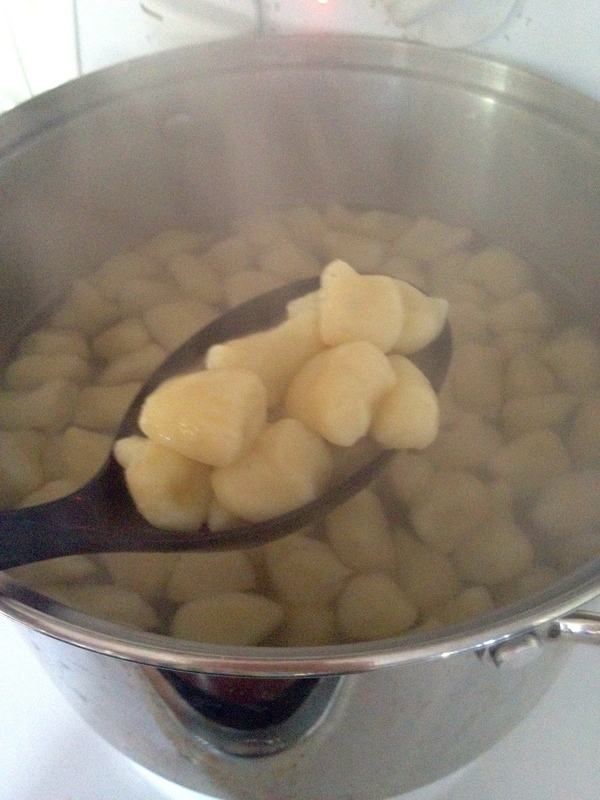 Remove the steamer basket, add more water to the pot and bring it back to a boil so you can cook the gnocchi in it. Put the potatoes through a rice mill into a large mixing bowl and let cool slightly before working with it. Add 3/4 cup all-purpose flour, 1 large egg, 1 large egg yolk, a pinch of salt and a tbsp of freshly grated nutmeg. Mix well with a fork and then turn the dough out onto a lightly floured counter. Knead the dough until smooth (1 to 2 minutes), adding more flour as necessary if dough is too sticky, 1 tablespoon at a time. This is the most important step, you don’t want to overwork the dough and you don’t want to add too much flour so just add enough until it stops sticking to your hands. Divide the dough into 6 equal pieces and one at a time, roll into a thin rope about 3/4″ thick. Cut into about 1″ rectangles and keep them on lightly floured baking sheets until ready to cook. Drop into boiling water and once the first ones start to float, cook for 2 minutes more and remove with a slotted spoon. Serve with marinara sauce or baked in small ramekins with a little ricotta cheese, or check out my recipe later in the week for a gnocchi dish with sausage, brown butter and broccolini! Wonderful! 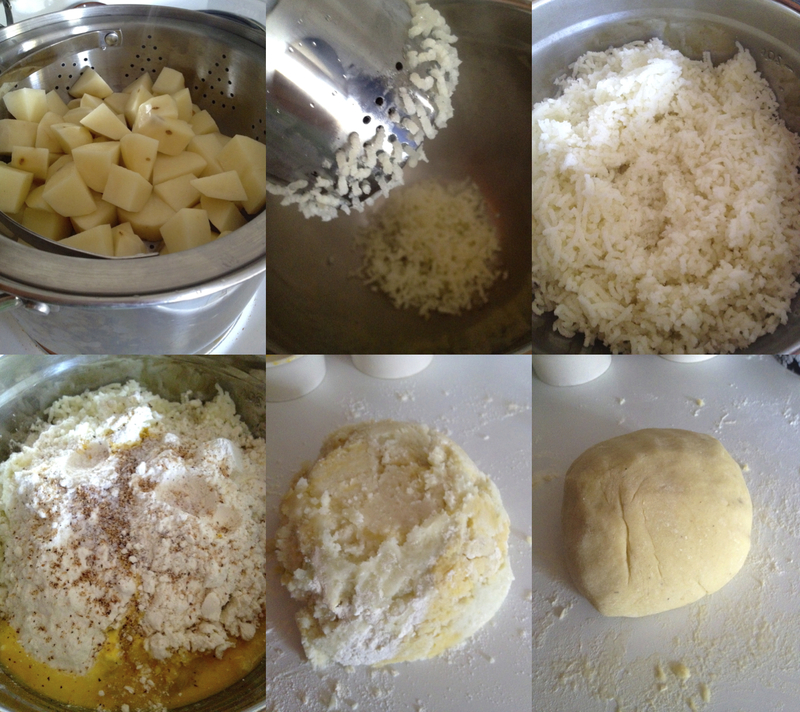 I did gnocchi a long time ago on my blog – it was so amazing. Perhaps I should revisit it! There’s so much to cook, Danielle! Just checked out your post, seems easier to leave the skins on the potatoes and then just mash with a fork… I’m going to try your way next time! Yes! do 😀 I’d forgotten how I make it, haha. This looks absolutely divine! I grew up eating gnocchi, but haven’t thought about making it myself. What a wonderful idea! I was the same way, didn’t even occur to me to try for myself! It was so easy and really tastes great! They were delicious and really very easy!